Meerkats are not new to popular culture (they appear in the folk tales of the San people of the Kalahari), but their arrival in the public’s consciousness, at least in the UK and the US, is a relatively recent phenomenon. Meerkats are small, sociable Southern African mammals that live in large family groups and eat insects and small reptiles. Their success with the global public is largely due to the documentary series Meerkat Manor, which was shown on TV between 2005 and 2008 and followed the lives of a group of meerkats in the Kalahari Desert. As a result of this exposure, meerkats have topped polls of the public’s favourite animals ever since. Their popularity increased further when a British-based insurance comparison website adopted them for their TV marketing campaigns. These meerkat puppets, with their friendly appearance, cute names, and Russian accents (why?) became so popular for a time that their catchphrase, “Simples!”, was on everyone’s lips. 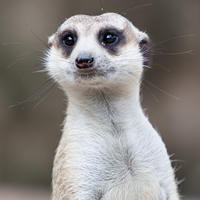 Now that their retirement from the company’s marketing campaign has been reported, the catchphrase thankfully seems likely to disappear, so there is little risk that it will need to be added to the dictionary, but meerkats have now made an appearance in the Cambridge English Dictionary. The popularity of meerkats, and their entry into the dictionary, demonstrates the power of television and the media to dictate the words that make up our daily lives. Whilst some of it may be ephemeral (such as simples), the fact that meerkats were little known outside Southern Africa 20 years ago and are now known to almost every child in Britain and beyond is testimony to the fact that language reflects cultural innovations. Meerkats are an example of another new entry into the dictionary: meme. In biology, a meme is a cultural feature or a type of behaviour that is passed from one generation to another, without the influence of genes, such as the use of tools amongst chimpanzees; but nowadays, in the language of social media, a meme is an idea, image, video, etc. that is spread very quickly on the internet. Meerkat generates almost 20 million hits on Google, whereas the arguably less cute echidna (also a recent arrival in the Cambridge English Dictionary) and the positively ugly naked mole rat (Google it) can only muster up a million between them. The power of cute animals should never be underestimated.